This could also be called ‘cold oatmeal’ or ‘refrigerator oatmeal’. I’m including this in the Reddit 52 week challenge under dairy, because it is in fact, over half dairy. Or in my case, non-dairy. Here’s the thing about me, I’m not a strictly non-dairy person. I’m more of a limited-dairy person. I’m not entirely intolerant, but more like ‘moderately bothered’ by dairy. That’s why you’ll see me posting recipes that use coconut milk instead of milk, but still will include butter. Sometimes I just dairy it up like crazy, guts be damned. Enough about my guts. I very loosely based this recipe from one I found here, but modified it like crazy, so now it’s MINE, all MINE! Muahahaha! Dump everything into a bowl, mix it, cover it, put it in the fridge overnight. This was a BIT too liquidy for me, but I like my oatmeal kind of dry. The kids said it was perfect, though. You can eat this cold, or you can heat it up in the microwave or stove top for a minute or so. Top it with whatever you want. 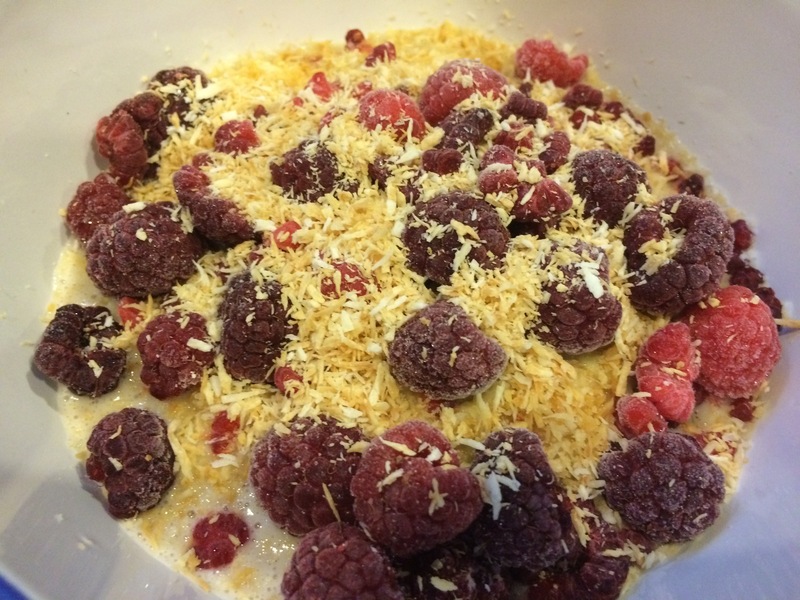 I used frozen raspberries and toasted coconut. My kids lobbied pretty hard for some whipped cream on top, so of course I let them have some. That makes it even more dairy-tastic. If you want to be a super hipster, you can put this in a jar and take it to work. Enjoy!